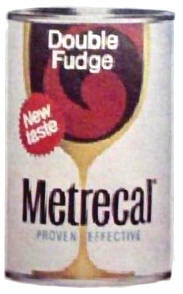 The brand name Metrecal was coined from the phrase "metered calories". Metrecal was the first high-energy, high protein beverage, like Slim-Fast or Ensure, introduced in 1959 by Mead Johnson Nutritionals (now owned by Bristol-Myers-Squibb), originally developed for those trying to gain weight. 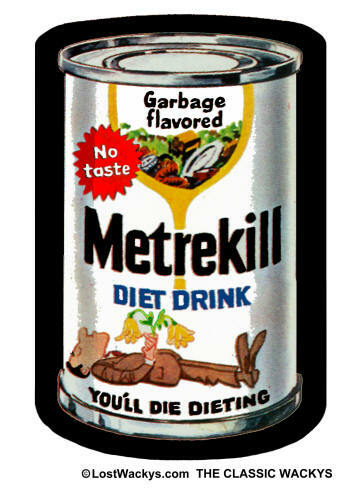 It quickly became popular among those trying to lose weight; one would drink Metrecal instead of lunch. (It is also kosher for Passover.) The Metrecal fad faded in the mid 1960s. In the late 1960s, Mead Johnson introduced a product called Nutrament, for those trying to gain weight: you would drink it in addition to your lunch. But Nutrament turned out to be the same product as Metrecal, with a different name. Metrekill never got to be a sticker, but if it had, maybe it would have looked like this. Twenty five of the 1973 2nd Series stickers were based on the 1969 Wacky Ads. The "cease and desist" order for Metrekill came after the wacky ads had ended, around 1970/1971. This brought on some confusion at Topps that almost caused them to drop Band-Ache as well, before the 1st Series premiered. In late 1972, while prepping the cloth series, it was thought that Metrekill's parent company was also the owner of Johnson & Johnson. "Mead Johnson" was written on the cloth proof sheet, along with instructions to replace Band-Ache with Liptorn, the only matching shaped title. 2nd Series Variations 2nd Series stickers were printed on 4 different backings -- White (common), Tan (uncommon), Black Ludlow (rare), and Red Ludlow (rare).